A related discussion can be found here (also courtesy of davedraper.com). I recently got around to building one of these wrist rollers.Â The project was perhaps the easiest and least expensiveÂ do-it-yourself job that I’ve tackled.Â I already had the rope and spring clip so I only had to purchase a short piece of PVC tubing and a hose clamp to secure the rope.Â My cost was less than $5. I began by cutting the PVC tubing to fit my power rack.Â I then secured a piece of rope with the hose clamp (as seen below). Next, I wrapped the hose clamp with duct tape.Â This step was done to prevent the jagged edge of the clamp from digging into the rope. 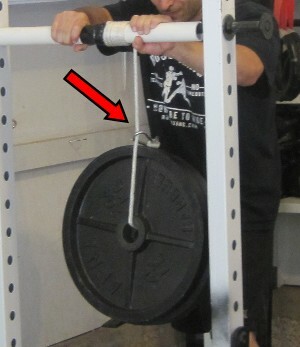 Lastly, I tied the end of the rope to a spring clip.Â The clip is used to keep the weight plates in place.Â Feed it through the weights and then clip it around the rope (as seen below). In summary, if you have a power rack, this DIY project will cost a few dollars and a few minutes of your time.Â It’s a great piece of equipment that will allow you focus solely on rolling heavier weights.Â I’ve only had it for a few days and I’m already quite pleased with the end product.Â I highly recommend it. I don’t do wrist curls, so i don’t know how much weight you use, but this could be done off a pullup bar too. @Seburo – The power rack is particularly convenient however as PVC simply slides over the rack bars (they come out, so the PVC can be quickly removed). 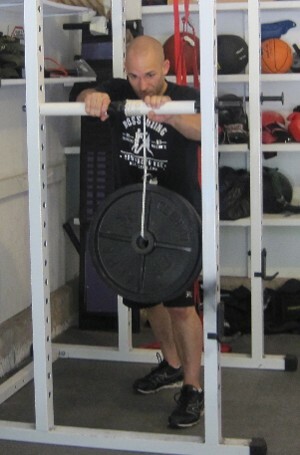 You can also adjust the height of the apparatus and the rack will hold as much weight as you can roll. You’ll never outgrow it. This is really cool! I do a lot of grip strength training as a newbie female power lifter- just making sure that my weak grip doesn’t dictate what I’m able to pull. This is a whole different level though. I’m going to try to have to rig something up. Dang, this is so simple and yet… not obvious. pretty cool too how it allows a much wider bar and stuff. Actually… if you wanted to grip the middle couldn’t you have a couple ropes and a plate on either side if it was wide enough? Could easily do things like wrapping in a towel for thicker grip without worrying about dropping the contraption too. Since it spins independently, if you let go it will spin and the plate will lower as opposed to the whole doing going bang. Actually, if the fall is decelerated, does that mean that this has more of a concentric than an eccentric component? Hi Ross,//HAVE A VERY NICE YEAR// first time with comments , but Im a big fan about your site, training methods and the mental factor from couple years ago , so the forearms are very important to me because mine are long and need to put effort with my conditioning, so this is good material, I hope upload a picture of my ” home wristroller “looks like HR. Giger (you got the picture right…)so thank you very much, FOCUS its my keyword. sorry , this is my right email, see ya. This is great man. I’d not even thought of using PVC. Thanks for the this, the inspirational videos, everything you do. Pingback: Joe in Stereo – 5 Fitness “Gadgets” That’re Worth It! I hope I am not late to try this wrist roller project! thanks Ross.